Show how each compound can be prepared from the indicated starting material. All carbon sources must contain three carbons or less. a) When you see 2 carbons and 1 oxygen, that the tell-tale sign that you're adding ethylene oxide (the simplest epoxide). But that would only leave you with an alcohol. How do you get to the ether? Using the Williamson ether synthesis. b) As I mentioned in problem 673, when you see an alcohol you are also looking at a carbonyl, because you can interconvert the two (alcohol to aldehyde/ketone using PCC, aldehyde/ketone to alcohol using NaBH4). To add the methyl group, convert the alcohol to a ketone (which is an electrophile), and then add methyl Grignard (a nucleophile). But once again, you are only left with an alcohol. How to convert it to an ether? The Williamson ether synthesis. 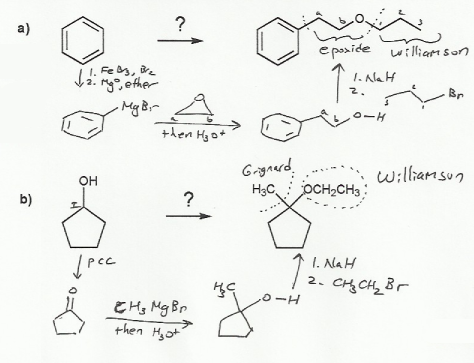 When you see an ether in a synthesis problem, remember the Williamson ether synthesis. It will come in handy. MendelSet practice problem # 699 submitted by Matt on July 21, 2011.